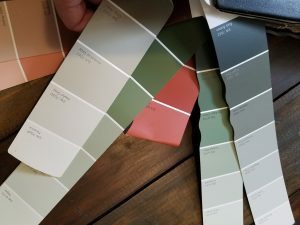 How do you choose paint colors for your home? In my experience as a professional painter, faux finisher and muralist for over 20 years, I have learned to become a pretty good colorist. 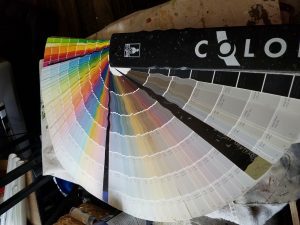 Customers used to have me come into their brand new white drywalled houses with hardly any furniture or window treatments and say, “What colors do I paint the rooms in my house?” With not much to go on, there are a number of steps to come to a decision. The first thing I would do was to look at the hair and skin tones of the customer because you need to look good in your own house! Blonds with fair skin look better in summer beachy colors like corals, pale blues, pale aquas, and spring greens. Darker hair and skin shades can handle more color as their hair and skin get darker. Brunettes look great in fall forest colors like auburn, rusts, oranges, wine colors, pine greens, and deeper yellow green, deeper blues. The darkest hair colors can handle the deep gem colors like ruby, emerald, onyx, and amethyst. All of the above color pairings look good with beiges, grays, and black. Whites like double antique white, almond, linen, ivory, mushroom, and pearl white are especially good large percentage choices. They are great mixers and may make up to 75% of the house including trim. You can use any brand of paint. All decks are set up the same and for good reason. There is a black and whites section; neutrals; colors from pale to bold; and energetic brights. The descriptions of the sections kind of tell you where to look. Everyone needs a large amount of white and neutrals, some pale Most of your choices should be in the whites and neutral sections. If I want a blue or green, I automatically turn my attention to the grays. That section has beautiful colors that don’t really show it until they are painted on a wall. The next step would be to look in the customer’s (your) closet. You are going to like the colors that you have chosen to wear on yourself! These are also great colors to put on walls. For example, if the customer has only blue jeans, white t-shirts, khaki paints, a red sweat shirt, and a pale yellow blouse; I can work with it. 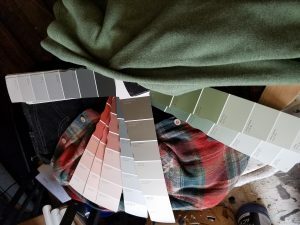 All paint colors I choose are paler and have added gray or brown in the color to make them duller and softer on an entire wall. 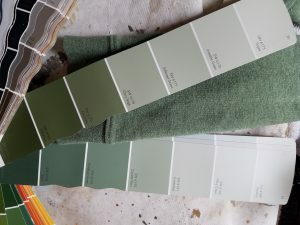 You can match the fabric color you like and then go 2 shades lighter and also match it in the neutral section of a paint deck even if the exact match is in the bright color section. The blue jean can be very faded and pale, white is white or a softer linen or almond; maybe a splash of true red and yellow; and a soft pale khaki. So, to put this in practice, go to your closet and put on your favorite complete outfit and head to the paint store. Keep in mind the environment of your house. Is it a beach house? Then pick out one of your beach outfits! You can design a room or even a whole house with this outfit. You just may want to change the proportions a little. If it’s a whole house, different rooms can each have one of the decided colors as its feature. I put one outfit together below as an example. 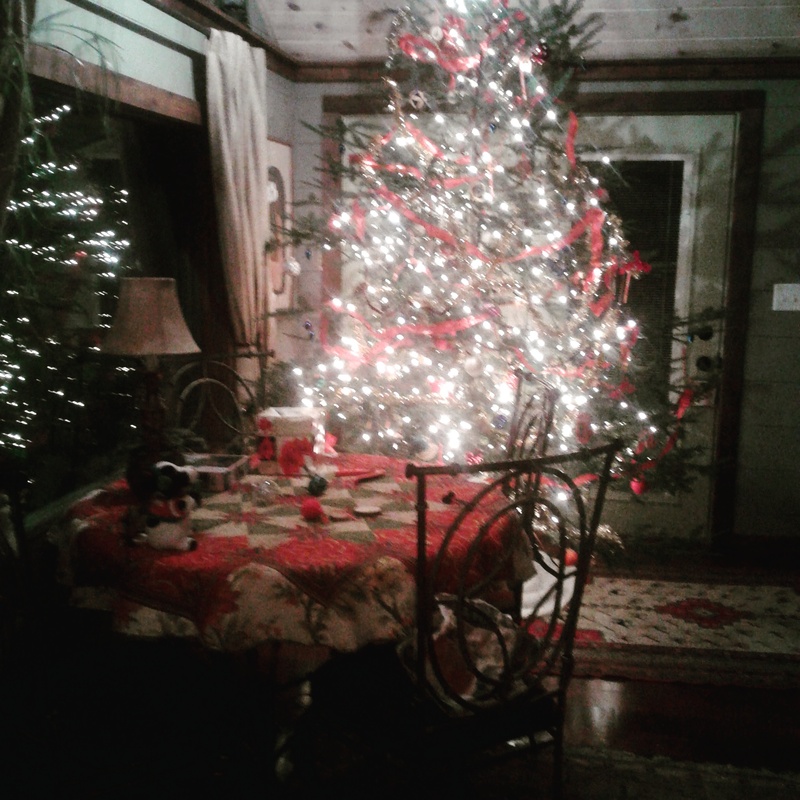 My particular house is a cabin on water in the northwoods, so my outfit, of course, is a woodsy one. So my favorite part of the ensemble is the medium green turtle shirt. 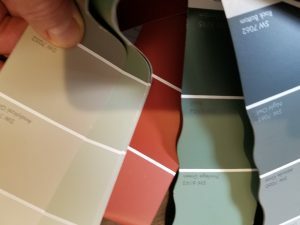 Below are some paint chips I found that are similar to the shirt color. 5. How much of each color? The palest of your color choices is where 50-80% of your house should get painted. If your talking of resale, that is essential. This percentage can be split into two pale neutrals also. The more strong color you add to a home, the more it narrows down the audience that will like it. I found a mushroom type color called Useful Gray SW 7050 and just darker than that on the chip is Analytical Gray SW 7051. 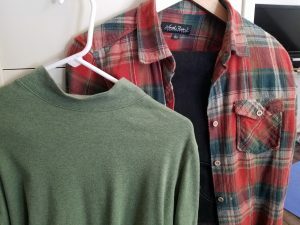 This color was part of the plaid in the other shirt. It’s not a big part of the outfit, but it’s the only neutral. 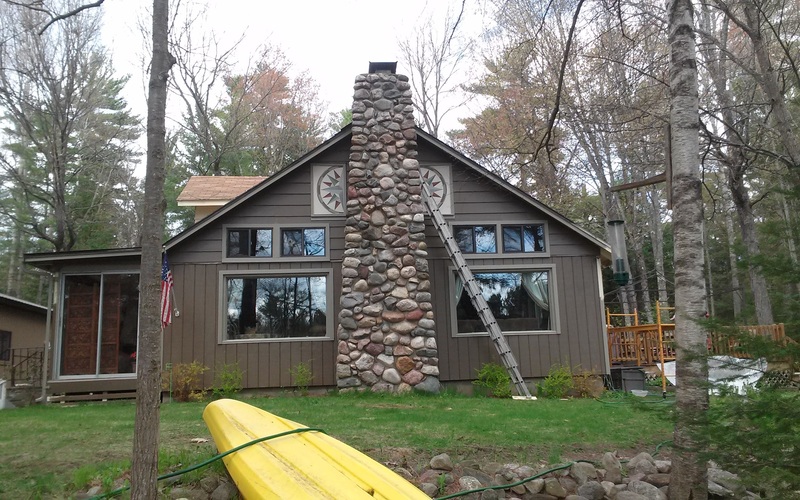 My other major color turned into painted trim so I chose double antique white. 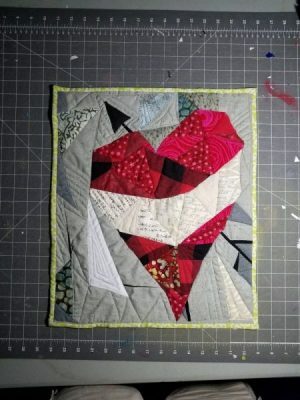 I would get some samples of the colors and put them on a wall to see if they should be warmed up a little or not. I liked all the greens in these two chips. If I were painting a whole room or hallway, it would be one of the top two lightest ones on the chips. Green could be the 50% color as long as it’s pale and dull. These chip’s lightest colors were Sagey SW 6175 and Liveable Green SW6176. 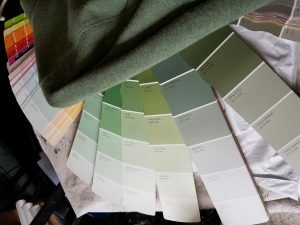 The other green chip had Conservative gray SW 6183 as my favorite. I didn’t like the others on that chip til the darker Dried Thyme SW 6186 that I wood use in fabrics or an accent wall or powder room. Probably a 10% color. The only burnt orange color I liked was Flower Pot SW 6334 which is pretty dark, so again, an accent wall or fabric choice in bedding or drapes, pillows, etc. Possibly a 5-10% proportion. The black jeans are the 5% part of the outfit I would use as accents in hardware or an accent pillow or possibly a wall depending on how dramatic I want to be and how much light there is in the house. Dark colors are great until you put them in the depths of a forest’s shade. 6. How much sunlight do you get? So, that’s another consideration in all your paint choices – how much light comes into the house? You may have to go up a shade or 2 on each paint chip. I usually pick a color and then automatically choose the next lighter one because it will look stronger filling up an entire wall or room for that matter. 7. Do all your choices look good together?